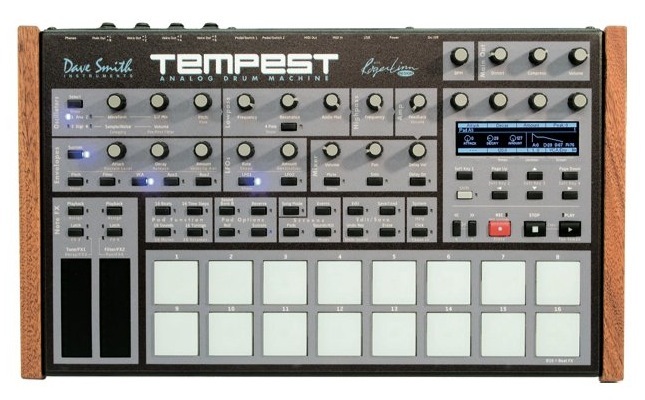 Dave Smith Instruments- Tempest Analog Drum Machine- Roger Linn Design. Remember the Boomchik from Mr Linn and Mr Smith? It’s here, but it has a new name at NAMM 2011, looks nice. it’s 2 analog and 2 digital Oscs. lpf filtering (analog), hpf 2pole hpf (like other DSI synths got). analog distortion & compressor (hey) and 16 Pads, 2 Ribbons.So it’s sort of analog Groovebox – sounds good as I can tell from a YT video..
this gonna be seen in the clubs over here, I guess.. SAMPLES can be used as well – but possibly in the second run/update – which is important to know, don’t know how long the patterns can be but sonically this is worth a look, don’t know if you can record without stopping it etc.. but there’s step progging in it Roger Linn says at 5:40.Since it is enough Pads you can also tune them. IT GOT DYNAMICS! here’s another more basic introduction by the nice guys themselves..
5. The touch sliders have both position and pressure response, both are assignable. 8. You can definitely take the wood sides off the machine, the metal is folded down over the sides so it looks just fine and rather sleek with the wood off. If you like I’ll take a picture for you guys when I get back home. 11. There probably will not be an editor on release but if someone would like to start one I will give you the CC/NRPN layout and all Sysex functions as soon as I code them in so you can get a head start. 16. The digital oscillators have a lot of options, but the DSP is less powerful than the chip we were using the Evolver. We will have the Prophet VS waveforms as well as a lot of noise options (some cool ones like green noise, UV noise, resonant noise, etc) for doing layering. 27. The USB interface will be MIDI only in version 1.0. I may add file system support for samples in version 2.0, but I don’t want to get anyone’s hopes up yet. It cannot do audio over USB. 4. Exotic combinations of time sigs (7/8 over 3/4 or whatever). The initial version will have the basic range of time sigs possible over the whole sequence. You could do 5/8 for example, or 17/32. Slighty more Xpensive? Hey Grand pa ,we have a crisi out there ,and we r not rich BH…The price of this TOY is way ,way too xpensive specially in the day where software are barely free…Even Akai mpc are way cheaper..I suggest you change your price strategy,You will have to anyway! Otherwise this product will have no Future! !You seems to forget the Future are the kids out there,and the kids do not have 2000 dollars just to experiment !!!! well, there is a lot of ppl who got the money, theres synths that are beyond 3k€ , this machine may have problems as long as it has bugs or not implemented features that are on the specs list, it has analog components, so it wont be as cheap as an electribe.